CureYourSystem - Page 59 of 68 - Cure your system now! Almost every user is keen on keeping their system safe, and many malware developers exploit this natural concern and make money on it. 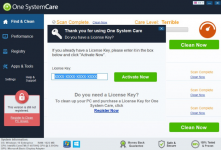 One SystemCare is one of those applications that are presented as a PC aiding program that would solve system problems in several clicks. Unfortunately, instead of helping to improve system performance by removing leftovers and restoring broken files for real, One SystemCare only imitates these functions. Though it may seem that changing a search engine cannot do any harm, it turns wrong with browser hijackers. Search.siviewer.com is a search engine that shouldn’t be trusted and set as the main page. The reason for this warning is the nature of the page - in fact, the search domain is a browser hijacker that presents corrupted results. Social2Search threat is created to infect systems of those users who are interested in social online activities, as it promises to improve their daily browsing experience with embedding some social elements to the search. 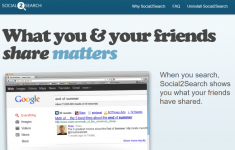 This means that a user who has Social2Search installed will get additional information about the activities of their friends in social networks and be shown the related links in search results. Tide Search threat combines the features of several malware types - Potentially Unwanted Application, adware, and browser hijacker. If it ends on your system you will soon notice it, as the application alters a browser behavior dramatically. 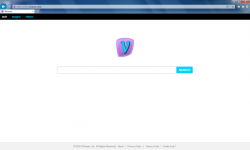 First change you notice will be a different start page and main search engine, which are now search.tidesearch.net. 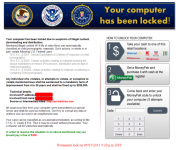 Kovter is a dangerous money-extorting malware that belongs to the group of ransomware viruses. It was first recorded in May, 2014 and since then the threat has spread through the globe and infected thousands of computers. Kovter operates in the same manners as its forerunners - it overtakes a system and demands money for its restitution. Lately Kovter, however, exploited the disguise of governmental accusation. It blocked the screen with the notification of user’s law breaching and stated that there was a fine for the crimes. 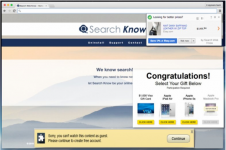 Search Web Know is a browser extension with malicious traits that can totally ruin any browsing session. The application collaborates with different websites that wish to increase their audience. For this Search Web Know displays advertisement that lead to these sites and causes sudden redirections. The ads can be pop-up windows or inserted to search results elements, no matter how they look, you should avoid clicking them. Though GetPrivate makes the first impression as a reliable program that assists in creating a Virtual Private Network (VPN), lates it shows the features that makes people thinking about how to remove GetPrivate application. 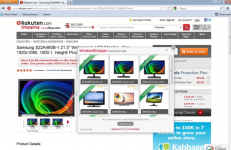 The change of opinion happens due to the ads that GetPrivate brings with it to browsers. If you open your browser and see elex.com page as the main one, then there is bad news for you - your system is infected with a malware. Elex browser hijacker is presented in the form of a page that looks trustworthy at the beginning, as it resembles any other search page, though later it becomes impossible to bear the intrusive activities of the hijacker. Superfish application or Superfish Windows Shopper is widely spread adware that infects computers and starts malicious activity that prevents normal browsing and brings money to its creators. First of all the adware installs itself into browsers and collects information on user’s preferences, then it becomes basis for the ads content.